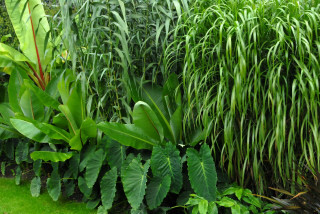 Although fundamentaly a fan of the giant reed, there came a point in this border where the plant was simply taking up too much space. Having studied some pre-digital pictures of the garden, it became clear just how much planting space was being lost due to the spread of this plant. It was not simply the foot print that was growing, the giant reed was pushing and shoving its way over surrounding plants depriving them of light and moisture. This picture shows (with a bit of straining) how the plant has grown from its original position. The flower pot in the middle is of a similar size to what the original plant would have arrived in. Over subsequent years the plant spread out in a circular fashion, each year leaving a larger and larger bald spot in the middle. The canes to the rear were growing up against the wall in the manner of a marching band led up a blind alley. The canes to the front were marching relentlessly towards the lawn. These pictures show the plant in its final two seasons. A palpable sense of discomfort overwhelms these pictures. 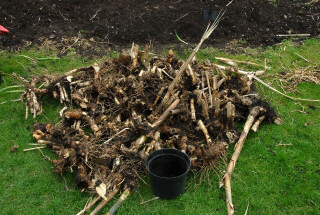 The decision to remove the clump of Arundo donax had been floating around for some time. The job however was put off for a couple of years as it was assumed it would be a pig of a task. By the time the canes had nearly reached the lawn it was time for action. 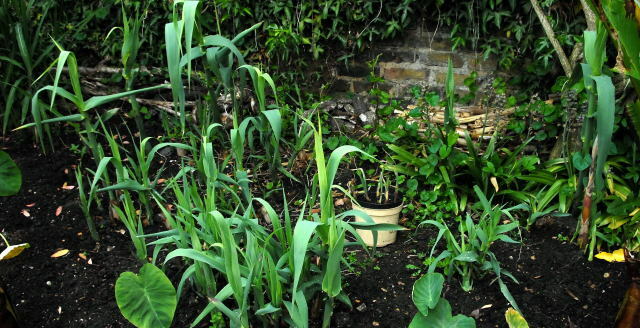 The job was undertaken in early March before any signs of growth were visible. After a bit of exploratory digging the it could be seen that some of the rhizomes went down about a foot (30 cms) into the soil. 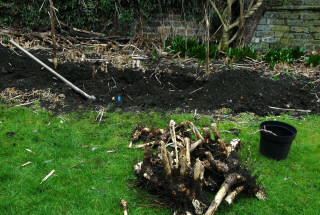 Fortunately with the use of a mattock, the rhizomes came away relatively easily. Standing on top of the roots and hacking towards them was quite effective. 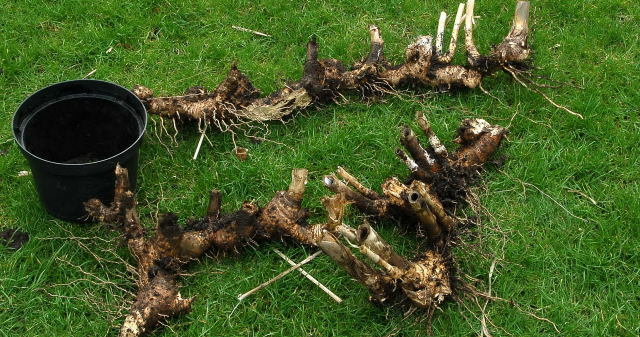 The rhizomes were surprisingly brittle and came out without too much resistance. 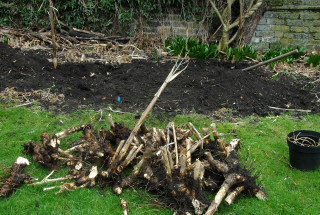 The pile continued to grow until all the rhizomes were removed. 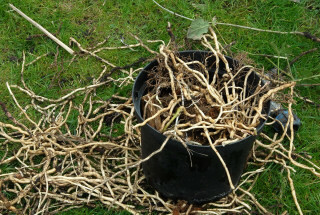 The black pot again gives an idea of how much the plant had spread over a 10 year period (approx.). The total time to dig it out was just over 1½ hours (including faffing about taking pictures and initial head scratching). A bit more detail of the individual giant reed rhizomes is shown here along with the now rather attention seeking flower pot. An other incentive to remove the giant reed was to remove as much as possible of a bindweed (Convolvulus sp.) community that had taken up residence amongst the Arundo rhizomes. 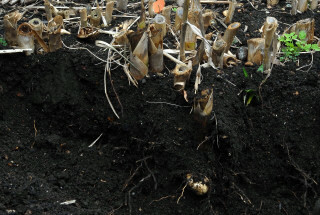 Unlike the bindweed, only one small section of the Arundo donax rhizome managed to evade capture. 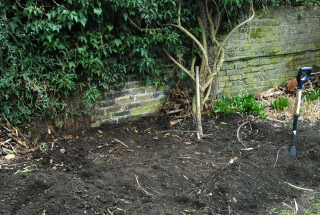 The newly cleared out area which left plenty of space for a couple of red Ensete's to be planted. See below. There is a more - " and breathe...and relax..." feel to the border now than the pictures further up the page. Canna indica purpurea - these were grown from seed collected eight years earlier but had nothing like the stature of their parents. (The plants were started the previous year and the best plants selected). 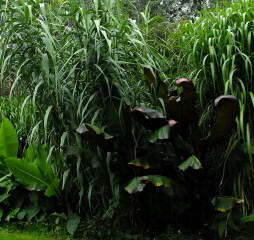 Ensete ventricosum - green variety. This one is actually about 4-5 years old but has never really grown much. Miscanthus floridulus - the tall fountain grass, probably called Miscanthus giganteus these days. 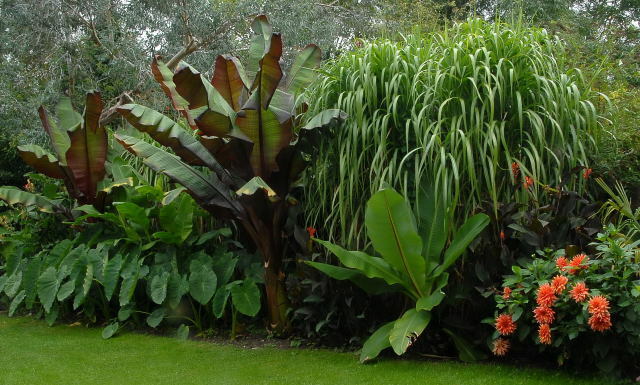 Ensete ventricosum - red variety x 2 at the end of their second full season. Colocasia esculenta are the aroids fringing the border. Canna tuerckheimii - second year from seed. Ensete ventricosum - red variety x1 .Same year class as the other two.